The new submarine will be a major boost to Indonesia’s burgeoning undersea warfare capabilities. The Indonesian Navy (Tentara Nasional Indonesia – Angkatan Laut) has commissioned its first attack submarine in over three decades this week. The first out of three ordered Type 209/1400 Chang Bogo-class (a license-built variant of the German Type 209 sub) diesel-electric attack submarine was handed over by South Korean defense contractor Daewoo Shipbuilding and Marine Engineering (DSME) on August 2. The new boat was subsequently inducted into the Indonesian Navy in a commission ceremony at the Okpo shipyard shipyard in Geoje Island, in the southeastern part of South Korea attended by senior Indonesian officials including Indonesian Minister of Defense Ryamizard Ryacudu on the same day. 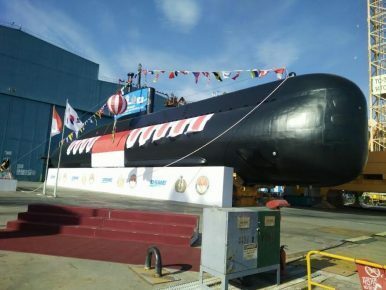 The new sub, designated Nagapasa with pennant number 403, will be homeported at the Palu Naval Base in the Watusampu province of Central Sulawesi, IHS Jane’s Navy International reports. Indonesia also plans to build a new submarine base on Pulau Natuna Besar, the largest of the Natuna Islands in the South China Sea. The Nagapasa was originally slated for delivery in March of this year. It is unclear what led to the four-month delay. Prior to the handover, the boat underwent extensive builder and sea trials off the Korean coast. Like the lead sub of the new Nagapasa-class (Chang Bogo-class), the second boat slated for service in the Indonesian Navy will be built in South Korea. The last submarine will be assembled by Indonesian state-owned shipbuilder PT PAL in Surabaya, Indonesia under a technology transfer agreement. PT PAL is expected to receive the modules for the second Nagapasa-class submarine in block form from DSME this year. PT PAL is scheduled to begin assembling the third sub at its new facilities in Surabaya under DSME guidance in 2018. The remaining two subs are expected to be commissioned in 2018 and 2019 respectively. “The 1,400-ton submarines have an operational range of approximately 10,000 nautical miles and are multipurpose vessels capable of conducting anti-surface warfare, anti-submarine warfare, and Special Forces missions,” I explained elsewhere. The submarine features eight 533 millimeter tubes for torpedoes and guided missiles, and will be operated by a crew of 40. The new boats are expected to serve in Indonesia’s Navy for at least 30 years. The last time the Indonesian Navy received new submarines was in the 1980s with the delivery of three German Type 209/1300 (Cakra–class) diesel-electric attack submarines. Indonesia and South Korea concluded a $1.1 billion contract for the three Nagapasa-class diesel-electric submarines in December 2011 as part of the Ministry of Defense’s 2024 Defense Strategic Plan, which calls for the acquisition of at least ten new submarines. Indonesia is expected to place an order for three more submarines in the coming months. Contenders include Russia, China, and France. The Indonesian Navy might also choose to place a follow-up order with DSME.